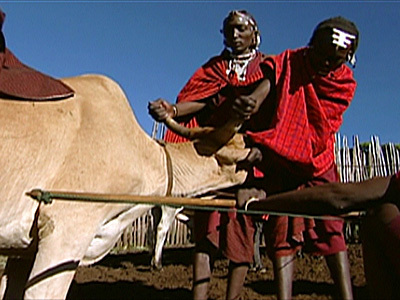 Cattle are at the heart of the Masai's economy and their pastoral lives. Tepiit ole Saitoti, a Masai warrior, once wrote, "Without the land and cattle, there will be no Masai." The Masai, who arrived in East Africa from the Nile Valley some time in the 15th century, live in southern Kenya and northern Tanzania along the Great Rift Valley on semi-arid and arid lands. Here, Shangi, a murran, or warrior, guards his clan's herds from wild animals in Ngorongoro, Tanzania. The Masai individually mark their cattle with long curving lines and intricate patterns designed to enhance the animal's beauty. 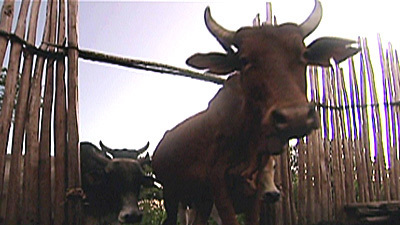 The Masai treasure their cattle and bond emotionally with them. They sing songs praising their cows and express affection for them. Bulls with large horns are especially prized, and young calves are tenderly cared for. The Masai's special relationship with cows stems from the belief that all cattle belong to them, a gift from the great god N'gai at the beginning of time -- a belief which justifies the ongoing practice of cattle raiding. 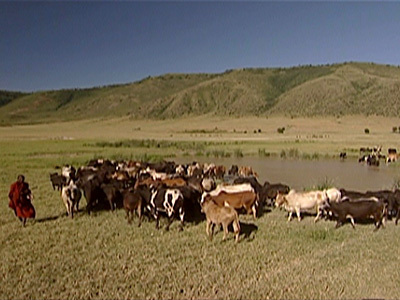 Shangi brings his clan's cattle down to drink at a water hole. Cowherds move their cattle from one area to another in order to find fresh water sources and to give grass in one area the chance to regrow. Traditionally, this practice was made possible because everyone in a locality shares access to water and pasture. 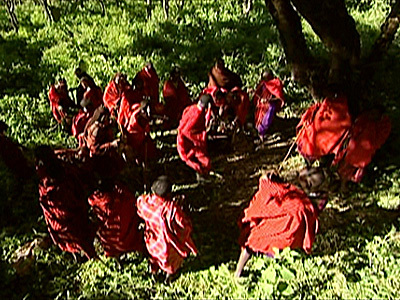 In the past, the Masai have been criticized for having too many cattle for their land. Studies show, however, that they are in fact very efficient livestock producers, rarely having more than the land can bear. At night, the herd is brought into the kraal. The kraal is group of houses, typically 8 to 15 huts, surrounding an enclosure used for the protection of livestock against wild animals. Settlements are typically fenced with thornbush, which are as sharp as barbwire. The Masai not only rely on cows for their food and livelihood, but also for their homes. The huts in the settlement are made of twigs, grass, and cow dung and urine. Once the mixture dries it is as strong as cement. It takes about seven months to build a hut. 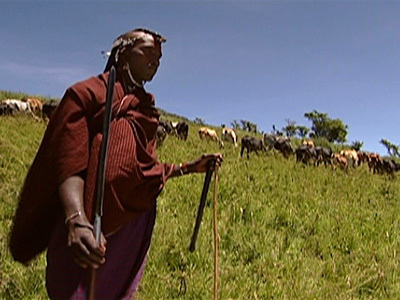 While Masai men herd cattle, Masai women are responsible for a variety of chores, including milking cows. A calabash of milk is the main and sometimes only meal of the day. Blood is another renewable resource and the warriors regularly harvest this valuable protein. To obtain blood, men shoot an arrow in the jugular vein. When done properly, it causes no long-term harm to the cow. The Masai drink cow's blood (often mixed with milk) which they believe makes them strong. 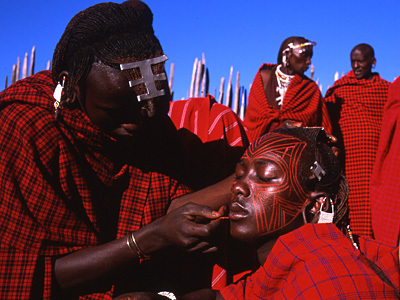 A Masai bridegroom is being decorated prior to a wedding at which cattle are given as dowry payments. A bridegroom needs about 30 cows to secure a wife -- the most expensive outlay of his life. Meat is reserved only for very special occasions -- feasts and celebrations -- when the Masai cash in their precious capital and kill a bull. Only the murran, shown here preparing for the occasion, are allowed to witness the slaughter which is carried out with skill and respect for the animal. When a cow is killed for meat, nothing is wasted and each part of the animal is ritually shared. The best cuts are reserved for the elders, next the warriors. Finally, women and children are served. 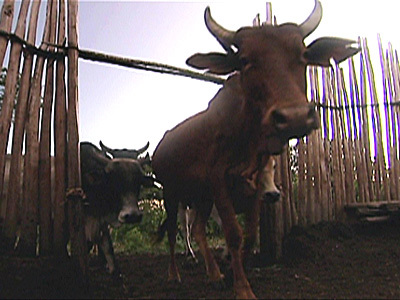 In June 2002 a Masai tribe from a remote village in Kenya gave 14 cows to the people of the United States. The tribe gave the cows -- the most precious gift they can give -- to help America recover from the September 11 terrorist attacks. 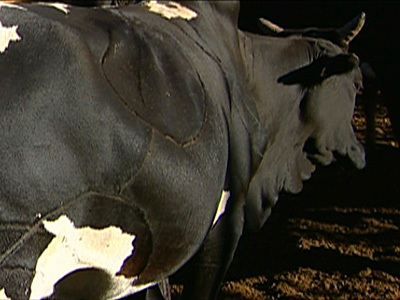 The cows were accepted by the U.S. Embassy in Kenya but because the animals would be difficult to ship to the U.S. they were sold. The funds were used to buy Masai jewelry, which will then be displayed at a September 11 memorial in New York City. 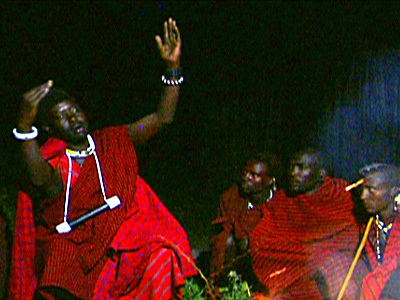 Here, a Masai elder describes the attacks to his tribe.